What’s in a Mitochondrial Cocktail? For patients with mitochondrial disease, a mitochondrial cocktail is a personalized mix of prescribed high-dose supplements. The combination and dose of these supplements are unique to each patient and designed to improve the patient’s disease manifestations and support the function of organs. The ingredients selected for the patient’s cocktail are based on individual needs, as mitochondrial disease can cause different problems in different patients. To prepare the prescribed mitochondrial cocktail, we use only the pure powdered form of each prescribed supplement. Without the personalized cocktails we prepare in our pharmacy, some patients would have to take 50 or more tablets or capsules a day to reach the required dose of the needed supplement. Commercially available tablets and capsules contain many additives such as fillers and preservatives which, if taken in very large amounts, can have negative effects especially in patients with mitochondrial disease. Our cocktails do not contain fillers or preservatives. Using the pure powder also allows us to be respectful of any specific dietary or allergy needs a patient with mitochondrial disease may have. Alpha Lipoic Acid is an enzymatic cofactor within mitochondria, which means that it helps mitochondria to function properly. It is also a fat-soluble antioxidant which helps prevent the deterioration of cells by binding to metals and free radicals in the body. Arginine is an amino acid that is in involved in creatine synthesis and it stimulates the pituitary gland to release growth hormone and prolactin from the hypothalamus. Both of these hormones are needed for proper development of the body. 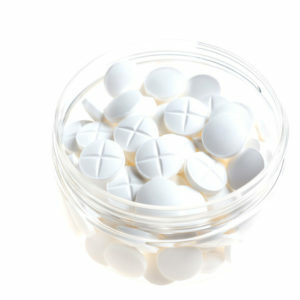 Arginine has been studied for its benefit in the treatment of metabolic stroke. Biotin is a coenzyme that is involved in many reactions in the body needed for maintenance of glucose and fats in the body. It is also involved in the formation of leucine, and important amino acid. Ubiquinol is a component of the mitochondrial electron transport chain. Therefore, it is necessary role in proper mitochondrial function to produce energy for our cells. As an antioxidant, it also helps prevent the deterioration of cells. Creatine combines with phosphate in the body to act as a source of energy that is released during metabolism. It is found mostly in the brain and skeletal muscle. Leucovorin is a reduced form of folic acid (vitamin B9). It is involved in several metabolic reactions. Folic Acid plays an important role in growth and development. Patients with mitochondrial disease tend to have lower than average levocarnitine levels in their blood. Levocarnitine transfers fats into the mitochondria for metabolism into energy used for the body. It also helps to remove toxic acyl compounds in the body. Thiamine is an essential coenzyme used in the metabolism of carbohydrates. It is also used to increase the availability of pyruvate for oxidation. Riboflavin is considered an important component of mitochondrial complexes I and II. It is necessary for tissue respiration, the process by which cells absorb oxygen and release carbon dioxide. It is also required for the activation of Vitamin B6 (pyridoxine) and conversion of tryptophan to niacin. Vitamin C is a water-soluble vitamin that is also an enzymatic cofactor and antioxidant. It plays a role in carnitine, hormone, and amino acid synthesis in the body. It also increases iron absorption and is required for its storage in the body. It is needed for the body to make connective tissue. Vitamin C helps to form collagen, which is a protein found in bones, cartilage, muscles, tendons, ligaments, skin, and blood vessels. Vitamin E is an antioxidant and helps protect Vitamin A and Vitamin C from oxidation. It also protects cells against destruction by free radicals. This information provided is for reference only and does not constitute clinical assessment or judgement in regards to a patient’s condition. Please consult with your physician for more information and before beginning or altering any medication, vitamin, or supplement regimen.